3 Methods to Recover Forgotten Opera Browser Password? 3 Methods to Recover Forgotten Opera Browser Password ? Posted by Vicky Tiffany on Jun.28 2017 17:16:31 PM..
Opera is mostly used by users in Android Mobiles, and the internet surfing is generally done through mobile as people cannot use PC all the time everywhere. Thus forgetting the password to opera web browser can really turn out to be a real mess. If you are unable to access websites through Opera Web browser, either from your iPhone or Windows PC, there is no need to worry at all. 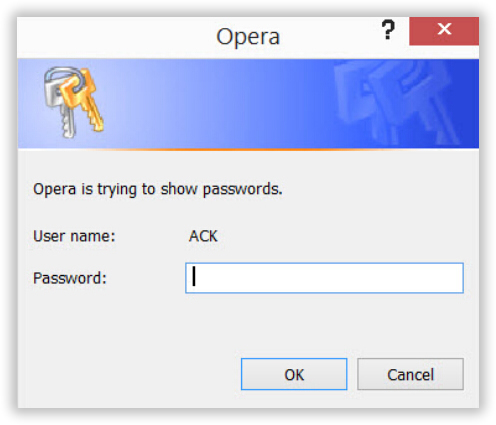 The following article would demonstrate you the methods to recover your passwords of Opera web browser. Basically, when you enter your details in a web browser, there are features available in Opera to store those information somewhere safely out of the user's sight. So the point is, if you know those hidden locations and the ways to get in there, the recovery of password is not a difficult task as such. Thus the article would help you manage those locations and to retrieve your Opera passwords at the same time at one go. As mentioned already, the passwordss recovery is all about getting in the secret locations of Opera browser to retrieve the saved details. But in order to do that, user need to know the basics of handling internet browser from their system. So before you start with the methods for application, better get a grip over how to use the Opera browser, which will make your task easier. 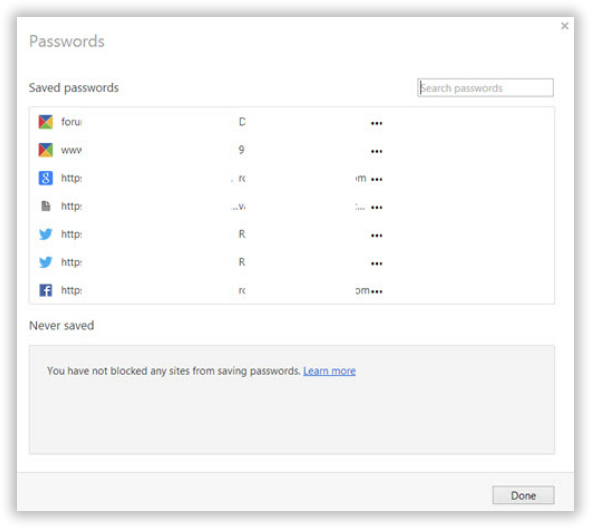 Method 1: Recover Opera Password using "Manage saved passwords"
Step 1. Open the Opera Web Browser from your computer. Step 2. Go to the top left corner of the Opera window and click on "Options" button. Step 3. Once you do it, a small dialog box would appear instantly at the bottom left corner of your Windows Home screen. Step 4. After that, you will see many options on the "Settings" window, scroll down the window and click on "Privacy & security". Step 5. Now you will see many options with check-box assigned to each of them. Step 6. For the following method to be functional, make sure, the "Offer to save passwords I enter on the web" option should be checked. Otherwise the passwords that you are trying to recover will not be stored in the hidden locations. Step 7. In order to view the passwords, click at the "Manage saved passwords" option at the bottom of the panel. Step 8. The passwords shown in the window now may be hidden with asterisk marks. So simply click on "Show" button to disclose the saved passwords to all the websites that you enter through Opera Web Browser. Step 9. On clicking the "Show" password button, the Opera may ask for your Windows login Password. Once you enter it, the passwords will be exposed to you. This is an extra protection measures provided in the recent versions of Opera. After finding your password, please do remember your Opera password in mind or write down on a text. You may also use other browser like Mozilla Firefox, Chrome and other. This article also works for finding password on Firefox and others. Also Read: How to View and Recover WI-FI Password If I Forgot? This is a shortcut method to extract your opera passwords than the one previously used, which was a bit hectic one. In this method you need a tool named as OperaPassView tool. Download it and install it in your PC before beginning the procedure to extract your password using this tool. Step 1. Once you have installed the tool in your System, open it by clicking on it. Step 2. As OperaPassView is a small password recovery tool used for opera web browser, the size of the tool would not be very large and can be downloaded and installed in a short time. Step 3. Once you are done with the step, you don't need to do anything else. Just on opening the tool window, all the passwords, usernames, and their corresponding websites will be shown on a list below. Step 4. After recovering the password from the OperaPassView, you can copy the passwords list to the clipboard and save it in a format termed "text/html/csv/xml file". You can also use password manager tool to manage your password easily. This method employs the use of another browser password recovery tool called WebBrowserPassView. Like the previous one, this too can recover and disclose your passwords at one go without any laborious tasks. But make sure, the passwords are stored in your web browser; otherwise it would be difficult to extract them. Step 1. After you have downloaded and installed the tool in your system. Open Opera Web Browser and select the tool by clicking on it. Step 2. Once the tool window opens up, it will show all your details that is passwords, username, and the websites one next to each other in a row. Step 3. When you have found out the exact password for whatever site, be it Gmail, or Facebook, etc. press "Ctrl + S" keys to save those passwords by the "Save Selected Items" in a format "text/html/csv/xml file". Forgetting Opera passwords can really be a fuss if you are in a hurry. And if you really don't have the time to reset your passwords in the Opera Browser, the problem gets worsened. Thus the methods mentioned above in this article would not require any resetting procedures to gain you the access to your websites. Simply follow the steps and the tools mentioned here. This will be enough for you to recover your Opera passwords to the website you frequently visit. NOTE: Another thing to remember is that if you have not visited any particular website using your opera web browser the details would not be stored in the browser password management, and it might be difficult to extract it from there.